Epictetus, a priest, brought Astius, the only son of his parents, to the Christian faith, baptised him and made him a monk. They then went off eastwards, to the region of Scythia, and settled in the Scythian town of Almirida (now Ramzina), at the mouth of the Danube on the Black Sea. They were tortured and killed for the Christian faith in about 290. 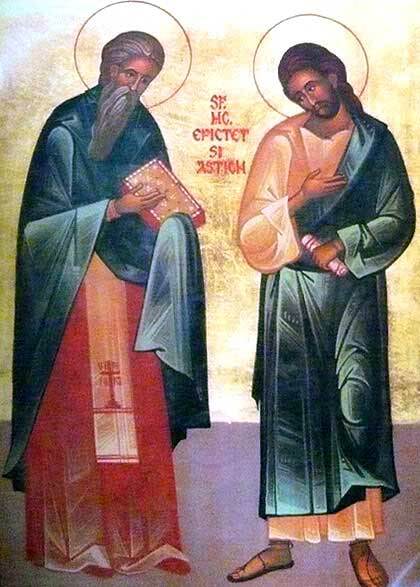 They both appeared after their deaths in great light to St Astius"s parents, Alexander and Marcellina, who turned to Christ and were baptised by Bishop Evangelus, who was himself then executed for Christ; "Evangelus, another angel", as is sung of him.